A task ventilator that produces tasks. A number of workers that do the processing work. A sink that collects results from the worker processes. This pattern works wonderfully as long as your consumers can outpace your producers. If you start producing tasks faster than you can process them, then messages will start backing up in ZeroMQ socket queues. This will drive the memory utilization of the processes up, make a clean shutdown of the distributed processing system difficult, and result in a sizeable number of messages lost in the event of a crash. This can be avoided by using ZMQ_REP and ZMQ_REQ sockets, but in that case you lose the speed advantage of a pipeline pattern. So without further ado, let’s dive into some code. I’m going to keep things simple for this example. I’ll define a function for the ventilator, a function for the worker, and a function for the sink. These will be started using multiprocessing.Process. For any Java programmers in the audience: Python has first class functions. There is no requirement to wrap a function in a class. """set up a zeromq context"""
"""create a push socket for sending tasks to workers"""
"""create a pull socket for receiving acks from the sink"""
"""initiate counter for tasks sent"""
"""send until we reach our batch limit"""
but keeping it simple for this example"""
"""create a pull socket for receiving tasks from the ventilator"""
"""create a push socket for sending results to the sink"""
"""receive tasks and send results"""
"""set up a zmq context"""
"""create a pull socket for receiving results from the workers"""
"""create a push socket for sending acknowledgements to the ventilator"""
"""receive a result and increment the count"""
"""acknowledge that we've completed a batch"""
There are two main conclusions I draw from these results. The first is that the pipeline pattern obtains an extremely high throughput due to the fact that it does not have to ACK messages. The second is that if your workers are performing work that takes any amount of time, you can limit the batch size to a rather small amount of messages without impacting your overall throughput. 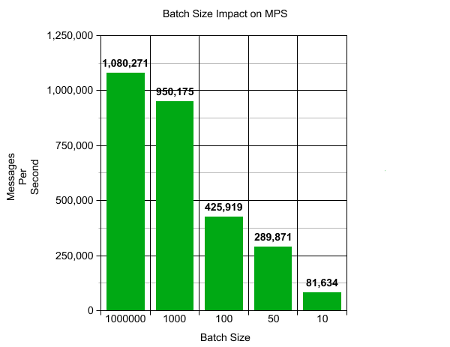 Even with a batch size of 10, a throughput of around 81k messages a second was obtained. As long as the combined messages per second your workers can process is less than the raw throughput of your pipeline for a given batch size, batched acknowledgements will give you some degree of flow control without compromising your throughput. The “batched pipeline pattern” allows tradeoffs to be made between acceptable message loss and throughput, and offers a great deal of control that a simple pipeline pattern with no batching does not offer. In my experience it is an extremely useful starting point a distributed system for processing streaming data.